Brad Alan Grey (December 29, 1957 – May 14, 2017) was an American television and film producer. He co-founded the Brillstein-Grey Entertainment agency, and afterwards became the chairman and CEO of Paramount Pictures, a position he held from 2005 until 2017. Grey graduated from the State University of New York at Buffalo School of Management. Under Grey's leadership, Paramount finished No. 1 in global market share in 2011 and No. 2 domestically in 2008, 2009, and 2010, despite releasing significantly fewer films than its competitors. He also produced eight out of Paramount's 10 top-grossing pictures of all time after having succeeded Sherry Lansing in 2005. Grey was born to a Jewish family in the Bronx, the youngest child of a garment district salesman. He majored in business and communications at the University at Buffalo. While attending the university, he became a gofer for a young Harvey Weinstein, who was then a concert promoter. The first show Grey produced (at age 20) was a concert by Frank Sinatra at Buffalo's Buffalo Memorial Auditorium in 1978. Grey traveled to Manhattan on weekends to look for young comics at The Improv. Grey brought comedian Bob Saget to New York, thus making Saget his first client. In 1984, Grey met talent manager Bernie Brillstein in San Francisco, California at a television convention. Having convinced Brillstein that he could deliver fresh talent, he was taken on as a partner and the Bernie Brillstein Company was re-christened Brillstein-Grey Entertainment. 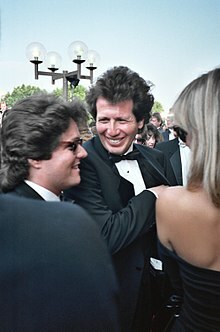 Grey began producing for television in 1986 with the Showtime hit, It's Garry Shandling's Show. In the late 1990s, Shandling sued Grey for breach of duties and related claims. Shandling complained that his TV show lost its best writers and producers when Brad Grey got them deals to do other projects, and that Grey commissioned these other deals, while Shandling did not benefit from them. Grey denied the allegations and countersued, saying the comedian breached his contract on The Larry Sanders Show by failing to produce some episodes and indiscriminately dismissing writers, among other actions. Both suits were settled avoiding a trial. Shandling did testify about Grey during the 2008 trial of private investigator Anthony Pellicano who worked on Grey's defense team. The value of the settlement to Shandling was later disputed by attorneys as being either $4 million or $10 million. In 1996, Brillstein sold his shares of the Brillstein-Grey company to Grey, giving Grey full rein over operations; the company's television unit was subsequently rechristened "Brad Grey Television". Grey produced shows such as Emmy Award-winning The Sopranos and The Wayne Brady Show. Other shows developed in the 1990s under the Brillstein-Grey banner included Good Sports, The Larry Sanders Show, Mr. Show, Real Time with Bill Maher, The Sopranos, NewsRadio, and Just Shoot Me! Grey also ventured into film by producing the Adam Sandler hit, Happy Gilmore. In 1996, actress Linda Doucett alleged that Brad Grey and Garry Shandling fired her from The Larry Sanders Show after her personal relationship with Shandling ended. Doucett reportedly received a $1 million settlement in this matter in 1997. In July 2000 - on the day of Scary Movie’s opening - Grey and Brillstein-Grey were sued by Bo Zenga and his Boz Productions in what became known as the ‘Scary’ suit. Zenga, at the time an unknown bit-part actor  “claimed he had an oral agreement with Grey’s management firm Brillstein-Grey Entertainment, giving him equal profits on the film”. ‘Scary Movie’ went on to make $278m worldwide. In 2002, Grey formed Plan B with Brad Pitt and Jennifer Aniston, with a first-look deal at Warner Bros. The company produced two films for Warner Bros: Tim Burton's Charlie and the Chocolate Factory with Johnny Depp, and Martin Scorsese's The Departed, starring Leonardo DiCaprio, Matt Damon, and Jack Nicholson. After Pitt and Aniston separated, Grey and Pitt moved the company to Paramount Pictures in 2005. In May 2006 Bo Zenga “filed a new suit against Grey personally,"  in which he charged Grey with using notorious private investigator Anthony Pellicano to illegally wiretap and conduct illegal background checks on Zenga during the original case. Grey denied any knowledge, testifying that "his dealings with Pellicano “all came through Bert Fields” and that “in every instance” Grey had never been given updates on the investigations by Pellicano." The suit was “dismissed, due to Zenga having lied and to statute of limitations issues.“  Bo Zenga's appeal continued after Grey's death, until that too was dismissed in December 2017. On 17 October 2017, writer Janis Hirsch alleged that her response to workplace sexual harassment resulted in a meeting with Brad Grey, during which he pressured her to quit her job during the late 1980s. Grey was named chief executive officer of Paramount Pictures Corporation in 2005. In his position, Grey was responsible for overseeing all feature film development and production for films distributed by Paramount Pictures Corporation including Paramount Pictures, Paramount Vantage, Paramount Classics, Paramount Insurge, MTV Films and Nickelodeon Movies. He was also responsible for the worldwide business operations for Paramount Pictures International, Paramount Famous Productions, Paramount Home Media Distribution, Paramount Animation, Studio Group and Worldwide Television Distribution. Among the commercial and critical hit films Paramount produced and/or distributed during Grey's tenure were the Transformers, Paranormal Activity, and Iron Man franchises, Star Trek, How to Train Your Dragon, Shrek the Third, Mission: Impossible III, Mission: Impossible – Ghost Protocol, An Inconvenient Truth, There Will Be Blood, No Country for Old Men, The Curious Case of Benjamin Button, Babel, Shutter Island, Up in the Air, The Fighter, True Grit, The Adventures of Tintin: The Secret of the Unicorn, and Hugo. During his time as chairman and CEO of Paramount, the studio's films were nominated for dozens of Academy Awards, including 20 in 2011 and 18 in 2012. After arriving at Paramount in 2005, Chairman and CEO Grey was credited with leading a return to fortune at the box office. He oversaw the creation and revitalization of several major franchises, Transformers: Revenge of the Fallen, Star Trek, and Paranormal Activity, which was made for $15,000 and generated $192 million at the global box office. Paranormal Activity 2 grossed $177 million worldwide, and the third installment in the franchise collected $205.7 million worldwide in 2011. A fourth installment was released in October 2012. The studio's 2011 results included Transformers: Dark of the Moon, which grossed more than $1.1 billion worldwide, and Mission: Impossible – Ghost Protocol, whose $694 million global box office tally makes it the most successful entry in that franchise. Paramount's 2012 slate included The Dictator which earned $179 million on a $65 million budget. During this period, Paramount forged productive relationships with top-tier filmmakers and talent including J. J. Abrams, Michael Bay and Martin Scorsese. In 2011, based on the success of Rango, the studio's first original, computer-animated release, Grey oversaw the launch of a new animation division, Paramount Animation. The 2010 Paramount slate achieved much success with Shutter Island and True Grit reaching the biggest box office totals in the storied careers of Martin Scorsese and the Coen brothers, respectively. In addition, during Grey's tenure, Paramount launched its own worldwide releasing arm, Paramount Pictures International, and has released acclaimed films such as An Inconvenient Truth, Up in the Air and There Will Be Blood. The success of Paranormal Activity also led to the creation of a low-budget releasing label Insurge Pictures, which released Justin Bieber: Never Say Never, which collected nearly $100 million in worldwide box office revenue. Grey was ousted from Paramount Pictures shortly before his death, a result of a power struggle between his backers and the family of majority owner Sumner Redstone, along with a series of flops that cost the studio $450 million in losses. Grey died on May 14, 2017 from cancer at his Holmby Hills home in Los Angeles, California. He was 59. ^ Cieply, Michael (2009-01-08). "New York Times, Jan 2009". Nytimes.com. Retrieved 2011-05-08. ^ a b Finke, Nikki (2012-01-02). "Paramount Topples Warner Bros For #1 In 2011 Market Share With Record $5.17B Worldwide, Jan 2012". Deadline.com. Retrieved 2012-02-10. ^ a b Cieply, Michael (2009-12-13). "New York Times, Dec 2009". Nytimes.com. Retrieved 2011-05-08. ^ Biskind, Peter (2012-06-11). "Vanity Fair, July 2012". VanityFair.com. Retrieved 2012-07-19. ^ Joel Stein (December 19, 2008). "Who runs Hollywood? C'mon". LA Times. Retrieved 16 January 2014. ^ O'Shei, Tim (15 May 2017). "Brad Grey, UB grad-turned-Hollywood mogul, dies at 59". The Buffalo News. Retrieved 18 May 2017. ^ "New York Times July 3, 1999". Nytimes.com. 1999-07-03. Retrieved 2011-05-08. ^ Bates, James (1999-07-03). "LA Times July 3, 1999". Articles.latimes.com. Retrieved 2011-05-08. ^ Abramowitz, Rachel (2008-03-17). "LA Times March 17, 2008". Articles.latimes.com. Retrieved 2011-05-08. ^ Halbfinger, David M. (2008-03-14). "New York Times March, 2008". Los Angeles (Calif): Nytimes.com. Retrieved 2011-05-08. ^ "Hollywood Harassment: I Was Fired from a Hit Show and Intimidated By Lawyers (Guest Column)". The Hollywood Reporter. Retrieved 2018-02-28. ^ a b c d e f g h Shprintz, Janet (2002-05-28). "Judge throws out Zenga's 'Scary' suit". Variety. Retrieved 2018-04-05. ^ Halbfinger, David M.; Weiner, Allison Hope (2006-03-24). "Evidence of Wiretaps Used in Suit". The New York Times. ISSN 0362-4331. Retrieved 2018-04-05. ^ Hazelton, John (2005-06-23). "Screen Daily". Screen Daily. Retrieved 2011-05-08. ^ "Brad Grey Escapes Liability in Anthony Pellicano Matter". The Hollywood Reporter. Retrieved 2018-04-05. ^ Finke, Nikki (2008-03-20). "Brad Grey's Pellicano Testimony: "Boring"". Deadline. Retrieved 2018-04-05. ^ B, Tom (2017-05-15). "Boot Hill: RIP Brad Grey". Boot Hill. Retrieved 2018-04-05. ^ "Comedy Writer Reveals Lurid Details of Harassment on Set — and Why It Cost Her a Job (Guest Column)". The Hollywood Reporter. Retrieved 2018-02-28. ^ "Paramount Corporate". Paramount.com. Archived from the original on 2011-06-12. Retrieved 2011-05-08. ^ "Reuters Jan 25th, 2011". 2011-01-25. ^ Finke, Nikki (2012-01-24). "OSCARS: Nominations By Studio – Sony 21, Paramount 18, Weinstein 16, Disney 13, Fox 10, Universal 7, Warner Bros 5, Roadside Attractions 4". Deadline.com. Retrieved 2012-02-10. ^ "Box Office Mojo: Paranormal Activity 3". BoxOfficeMojo.com. Retrieved 2012-02-10. ^ Subers, Ray (2012-02-07). "Around-the-World Roundup: 'M:I-4' Passes $600 Million Worldwide". BoxOfficeMojo.com. Retrieved 2012-02-10. ^ "Transformers: Dark of the Moon". BoxOfficeMojo.com. Retrieved 2012-02-10. ^ Miller, Daniel (2011-10-10). "David Stainton Tapped to Run Paramount Animation". HollywoodReporter.com. Retrieved 2012-02-10. ^ Lang, Brent; Oldham, Stuart (15 May 2017). "Former Paramount CEO Brad Grey Dies at 59". Variety. Retrieved 15 May 2017. ^ Smith, Harrison (May 15, 2017). "Brad Grey, 'Sopranos' producer who led Paramount studios, dies at 59". The Washington Post. ISSN 0190-8286. Retrieved May 15, 2017. ^ Kilday, Gregg (May 15, 2017). "Brad Grey, Former Head of Paramount Pictures, Dies at 59". The Hollywood Reporter. Retrieved May 15, 2017. ^ Faughnder, Ryan; Miller, Daniel (May 15, 2017). "Brad Grey, the old-school mogul who ran Paramount Pictures, dies at 59". Los Angeles Times. ISSN 0458-3035. Retrieved May 15, 2017. ^ "Univ Buffalo Archives". Buffalo.edu. 2003-04-03. Retrieved 2011-05-08. ^ "UCLA Health". UCLA Health. Archived from the original on 2011-07-19. Retrieved 2011-05-08. ^ "USC Cinema". Cinema.usc.edu. Archived from the original on 2010-08-26. Retrieved 2011-05-08. ^ "Project A.L.S." Archived from the original on 2007-10-11. ^ "Tisch NYU, 2004". Tisch.nyu.edu. 2004-11-09. Archived from the original on 2011-05-24. Retrieved 2011-05-08. ^ Pener, Degen (2013-06-19). "Paramount Pictures' Brad Grey Joins LACMA as Trustee (Exclusive)". HollywoodReporter.com. Retrieved 2013-06-24. ^ "The Larry Sanders Show: Flip (HBO): Winner 1998". Peabody. Retrieved May 15, 2017. ^ a b c "PGA Award Winners 1990-2010". Producers Guild of America. Retrieved May 15, 2017. This page is based on the Wikipedia article Brad Grey; it is used under the Creative Commons Attribution-ShareAlike 3.0 Unported License (CC-BY-SA). You may redistribute it, verbatim or modified, providing that you comply with the terms of the CC-BY-SA.